Trauma care in German-speaking countries: have changes in the curricula led to changes in practice after 10 years? Traditionally, in the German-speaking countries, trauma patients are treated by general surgeons specialized in trauma surgery known as the Unfallchirurg. Over the last decade, a trend towards a lower influence of surgeons and a higher influence of subspecialties in the emergency department has been noted. With additional transformations in the health care system towards highly specialized medicine and the arising of new (sub-) specialties, diversification in the management of the trauma patient appears to occur. The new curricula for surgical disciplines providing trauma care will widen this issue even further, moreover, triggered by the Anglo-American medical model. 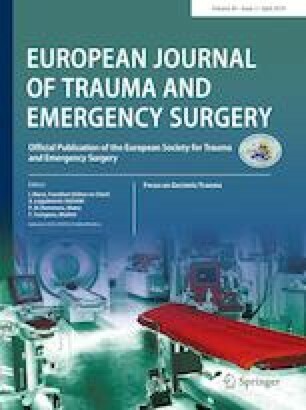 The primary aim of this study was to evaluate the current situation in German-speaking countries concerning the management of trauma patients. The interfaces between emergency physicians, orthopaedic and general surgeons have been investigated concerning the management of the trauma patients. Additionally, different future scenarios have been evaluated. An online questionnaire was submitted to members of the German Society of Trauma and Orthopaedic Surgery [Deutsche Gesellschaft für Orthopädie und Unfallchirurgie (DGOU)], including both general and orthopaedic surgeons, emergency physicians and also some members from Austria, the Netherlands and Switzerland. Questions dealt with demographic data, the current situation in the clinic of the responders in terms of management of mono- and polytrauma patients as well as fracture care. In addition, various future scenarios were evaluated. 293 members of the DGOU answered the questionnaire. The majority of the responders (45%) were orthopaedic surgeons and 34% were general trauma surgeons. Sixty-two per cent of hospitals run their emergency departments with emergency physicians. Treatment of both mono- and polytrauma patients in the emergency department is equally distributed between general and orthopaedic surgeons. Fracture care, however, is predominantly (65%) being performed by general trauma surgeons in both mono- and polytrauma patients. The majority of the respondents (80%) do not want to change the current situation and predict that in the future fracture care will still be performed by general surgeons’ specialized in trauma surgery. Approximately two-thirds of the responders do not believe that emergency physicians will play a bigger role in the management of trauma patients in the future. Despite the growing importance of emergency physicians, separated in the emergency room between surgical and internal medicine fields, in the acute care of surgical patients in the emergency departments, their role in the management of the polytraumatized patients remains limited. More than 13 years after the new curricula for orthopaedic and general surgery have been implemented in Germany, fracture care is still predominantly provided by general surgeons specialized in trauma surgery. In conclusion, it seems that the general surgeon specialized in trauma surgery still plays and wants to play the key role in the management of the polytrauma patient and fracture care in German-speaking countries. Sarah K. Kuhn-Régnier, Michael Stickel, Björn-Christian Link, Henning Fischer, Reto Babst and Frank J. P. Beeres declare that they have no conflict of interest. Deutsche Gesellschaft für Unfallchirurgie. Jahresbericht TraumaRegister. 2013. http://www.traumaregister-dgu.de. Zitat vom: 13.11.2016.